Originally uploaded by Paul M.
While apparently the rings were originally tied to the young ring bearer’s pillow, somehow they came undone right before the ceremony. Someone saw Dan’s ring fall, so that was picked up quickly, but Robin’s was already long gone. 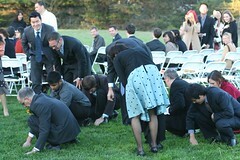 So, a large segment of the wedding attendees spent 15 to 20 minutes combing the grass for the elusive wedding band to no avail. A substitute was procured and the rest of the event went off without a hitch. Dan sent me a text message on Sunday saying that his brother-in-law rented a metal detector and they spent four hours Sunday morning… and finally found it! Damn. Four hours with a metal detector? I’m not sure I would have lasted that long. Dan + Robin’s wedding NOV 2 2007 from merpeck on Vimeo.